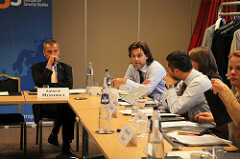 On 24 September, EUISS launched a Task Force on Russian futures. The Task Force aims to explore the horizon 2020–2025 by creating a core group of experts on Russian politics who will then generate a report about key trends by the end of next year. The first meeting examined the future of Russia’s policies towards the US, China and the Middle East. Participants discussed motivations behind Russia’s foreign and domestic policy, relations with its neighbourhood and the West, and Moscow’s stakes in the Middle East. The next meeting of the Task Force will be on the future foundations of Russian power, with a focus on the military, economic and energy dimensions.